DB locomotive 66132 stands at the head of train 6N09 at Claygate station on 13th June 2009. The bright orange marks on the cab side are the reflections of staff wearing high visibility clothing. Adjacent to the front of the locomotive the electrified 3rd rail has been slewed in order to allow the track to be replaced. 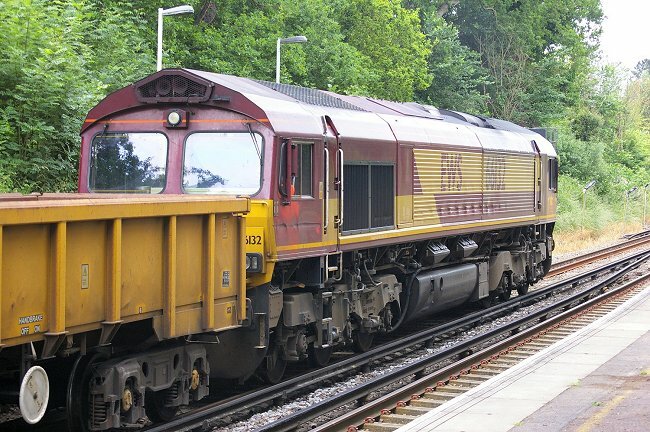 Train 6N09 was composed of type JNA private owner wagons belonging to Network Rail's National Logistics Unit. This is wagon number NLU 29474. 13th June 2009. This is one of the makers plates on a type JNA wagon. 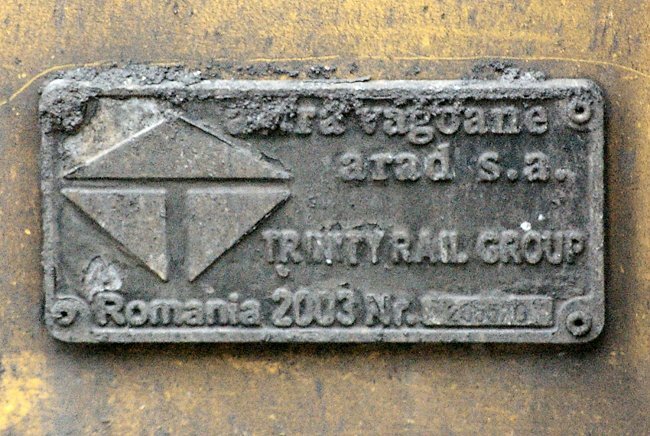 It shows that the vehicle was built in Romania in 2003 by Astra Vagoane at Arad, and that the maker is part of the Trinity Rail Group. A road / rail digger owned by Hydrex stands at the start of the track replacement work. 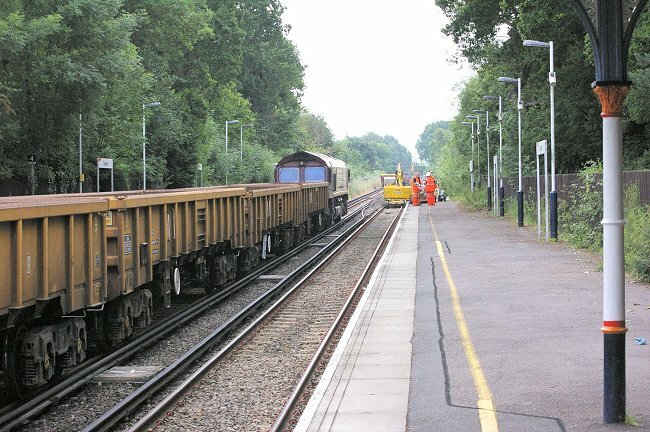 The track panels had been loaded onto a train earlier in the day and diggers had loaded old ballast into trains such as the one in the distance. 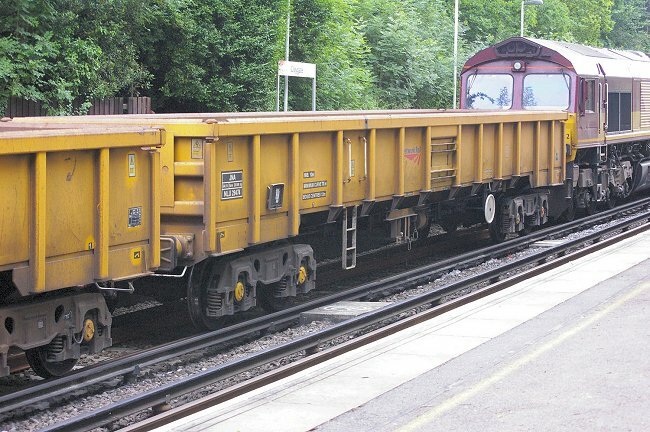 Future trains into the work area will bring in fresh ballast and sleepers. 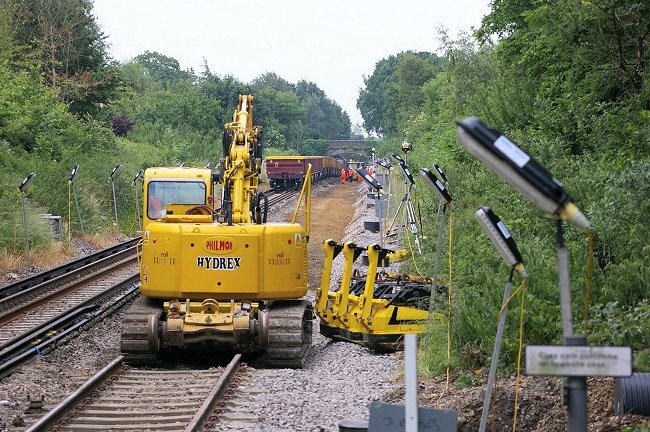 When the rails have been added a tamping machine will ensure the line is smooth enough to carry passenger trains. Locomotive 66132 waits in Claygate station to be called forward into the engineering work area.